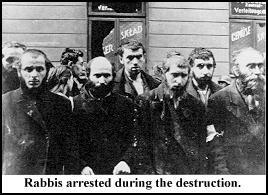 Jews arrested during the destruction of the Warsaw ghetto in Poland by the SS, sent to be gassed at Treblinka extermination camp. The Nazis invaded Poland in September of 1939. By October of 1940, they had confined nearly 400,000 Jews in a 3.5 square mile area of Warsaw which normally housed about 160,000. The area was surrounded by a wall 10 feet high and was sealed off on November 15, 1940. Jews were forbidden to go outside the area on penalty of being shot on sight. No contact with the outside world was allowed. Hans Frank, the Nazi Gauleiter (governor) of occupied Poland, declared in 1941, "I ask nothing of the Jews except that they should disappear." Thus the Nazis refused to allow enough food into the ghetto to keep the Jews healthy, forcing them to survive on a bowl of soup a day. Soon, 300 to 400 persons died each day in the ghetto from starvation and disease. By July of 1942, about 80,000 Jews had perished. On July 22, 1942, the SS, on orders from Reichsführer Heinrich Himmler, began a massive "resettlement" of the Jews, taking them out of the ghetto to extermination camps (mainly Treblinka) where they were to be gassed. The Jewish Council in the ghetto was ordered to deliver 6000 persons a day for deportation. In just two months, a total of 310,322 Jews were sent to their deaths in Nazi extermination camps. By the end of September only 60,000 Jews remained. In January of 1943, Himmler ordered the SS to remove the remaining 60,000 Jews from the ghetto by February 15. However, the remaining Jews knew by now that deportation meant death and chose to resist. A Jewish Fighting Organization, ZOB, had been formed, consisting of 22 groups, each having 20 to 30 men, boys and some women. The group had sent desperate appeals for weapons to anti-Nazi Poles outside the ghetto and were supplied with enough weapons to successfully resist deportation by attacking from rooftops, cellars and attics. As a result, 20 Germans were killed and 50 wounded. The Jewish resistance, combined with the severe winter weather and a shortage of trains, prevented the SS from meeting Himmler's February deadline. In the spring, Himmler ordered the SS to conduct a "special action" against the Jews that would clear out the entire ghetto in just three days. By now, the size of the ghetto had been reduced to an area measuring only 1,000 yards by 300 yards. On Monday, April 19, 1943, the Jewish feast of Passover, over 2000 Waffen SS soldiers under the command of SS General Jürgen Stroop attacked with tanks, artillery and flame throwers. A fierce battle erupted between the heavily armed Germans and 1200 Jews armed with smuggled in pistols, rifles, a few machine guns, grenades and Molotov cocktails. The first attack by the SS was repulsed by the Jews, leaving 12 Germans dead. The Germans renewed the attack, but found it difficult to kill or capture the small battle groups of Jews, who would fight, then retreat through a maze of cellars, sewers and other hidden passageways to escape capture. On the fifth day of the battle, an infuriated Himmler ordered the SS to comb out the ghetto "with the greatest severity and relentless tenacity." SS General Stroop decided to burn down the entire ghetto, block by block. A report filed by Stroop described the scene: "The Jews stayed in the burning buildings until because of the fear of being burned alive they jumped down from the upper stories…With their bones broken, they still tried to crawl across the street into buildings which had not yet been set on fire…Despite the danger of being burned alive the Jews and bandits often preferred to return into the flames rather than risk being caught by us." 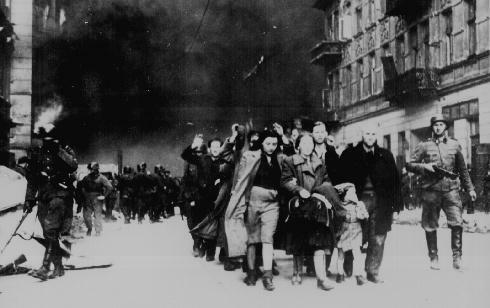 The burnings and renewed German attacks continued, but the Jews in Warsaw resisted for a total of 28 days. On May 16, 1943, amid the relentless German assault, the Jewish resistance finally ended. Stroop sent a battle report stating, "The former Jewish quarter of Warsaw is no longer in existence. The large scale action was terminated at 2015 hours by blowing up the Warsaw synagogue…Total number of Jews dealt with: 56,065, including both Jews caught and Jews whose extermination can be proved." Polish sources estimated 300 Germans were killed and 1000 wounded.